OUT THE FRONT OF BANGKOK SMILE DENTAL CLINIC, just off the manically Sukhumvhit Road, tuk-tuks blurt their way across the intersection and food vendors grill chicken on an open flame. Had they walked into the air-conditioned calm of the clinic, they might have picked up some tips from compatriots on where to find the best street food.Bruces and Sheilas bond in the waiting room of this unofficial Australia House, trading tips about great bars in Pattaya and the pitfalls of Phuket until they’re called to discuss molars and root canal. The 45-year-old man sitting on the couch, idly flicking through beauty magazines, can claim some responsibility. Gary Flowers has been shepherding dentally challenged Australians into this clinic for 18 months. A construction surveyor, Flowers’s move into dental tourism took shape as he studied a jumbo full of gap-toothed Aussies on a flight back to Brisbane from his job in Singapore. He’d just had some veneers and crowns put on his teeth and was impressed with the work and the price. An idea sparked. Could he package a tour, combining an Asian holiday and dental work, for the price you’d pay for dental work alone in Australia? Aussie Dental Tours was born. After a false start in the Philippines (“It’s cheaper but we had too many complaints”), Flowers turned to Thailand. lie hit the internet and hooked up with Dr Sermsakul Wongtiraporn of Bangkok Smile. 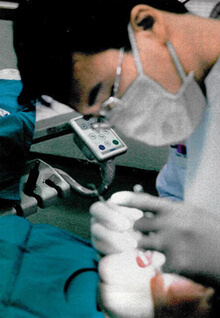 Known to Australian patients as Dr Bob, Sermsakul, studied for his degree and graduate diploma in Bangkok before working in dental implantology in UCLA, in the United States. To date, Flowers has sent about 100 Australians to his three clinics in Bangkok — and claims there have been no complaints. Flowers’s spiel is straightforward: save up to 70 per cent on dental work. He offers an escorted tour, the type O’Neill is on, for about $2800, including airfares and 14 days’ accommodation with breakfasts. Otherwise, if you’re seasoned travelers like Patricia and Allan Penny, the Caloundra retirees also waiting on the couch, he’ll organize an appointment and information pack for less than $100. Patricia calls herself a “teeth person”. Like O’Neill, who’s now upstairs with a dentist, she’s “just got a thing about teeth”. Twelve months ago she had a tooth pulled for AU$320. Bangkok Smile quotes AU$25 for a simple extraction, AU$120 for the trickiest of wisdom teeth. She learned of such differences after ADT advertised in her local paper. ‘l’he 68-year-old had been thinking about investing in dental bridges for four gaps in her mouth that she thought were forcing her to overuse her front teeth. Given they were traveling to Bangkok en route to Russia.and Spain, Allan told her, “Just do it”. So here they sit, waiting for their consultation. Allan’s going to ask about replacing his old amalgams. He thinks they could be contributing to his unsettled gut. Patricia is also keen to veneer some teeth but she’s got no idea what all the work she wants is going to cost. Her “excellent” Sunshine Coast dentist charges AU$160 for a quote. “I’m thinking [it will cost] about AU$3000,” she says, as her eyes turn to the commotion coming from upstairs. FOREIGN MEDICOS HAVE HARDLY ENJOYED A BIG rap in Queensland since the exposure of the deadly work of Indian-trained surgeon Jayant Patel A costly inquiry has been held and protocols set up to ensure overseas medical recruits meet Australian standards and work only in their approved disciplines. We rightly complained the government had been gambling with our health. Yet when confronted with a quote of AU$30,000 for dental work as in O’Neill’s case, or a public hospital waiting list for a hip replacement of up to 12 months, some of us are prepared to take the gamble ourselves. They reasoned that Thailand’s medical tourism had flourished, technology and training improved and that Australian dentists simply overcharged. The fact is, Australia has a dental dilemma: we’re chronically low on dentists and we need a lot of work. Adult decay rates are the second worst among OECI) countries, hut we will be short 1500 dentists within four years. It’s reasonable to conclude the basic law of supply and demand is factored into the pricing policies of private clinics overwhelmed by patients, but the Australian Dental Association’s CEO, lawyer Robert Boyd-Boland, denies it. He says prices have risen in step with the cost of health provision. Economies certainly kick-started Thailand’s positioning as the world leader in medical tourism. And it’s only going to get bigger and more influential, according to Ruben Toral, the slick American marketing man for Bumruograd International, the five-star, up-to-the-minute Bangkok private hospital that takes credit for launching Thailand’s medical tourism juggernaut. The Asian financial crisis of 1997 hit the Land of Smiles just as the US-managed, Thai-owned Bumrungrad Hospital Public Company Ltd finished building its bedazzling 554-bed facility aimed at treating wealthy Thais and expatriates. The Thai baht collapsed. “Overnight,” says ‘Toral, “our $US9O million debt became a $180 million debt”. UPSTAIRS IN ONE OF BANGKOK SMILE’S COMPACT consulting rooms 1 Dr. Sunisa Jueng JitRak is reexamining the X-ray that sent O’Neill into a spin and down on Australian dentists, to be fair, she was already halfway there. She’s suffered teeth problems for six years and has shopped around Queensland dentists trying to find relief she’d already spent about $12,000 on extractions, root canal, crowns and bridges before deciding to check out Thailand. Sunisa has agreed to show me the cause of O’Neill’s dummy-spit. She point to a root canal on an upper front tooth towards the left, and explains it has not been filled to the apex. It’s about 3mm short, not sealing off the roots from bacteria. It’s infected. Sunisa, though, is not as keen to dump on her fellow dental professionals as O’Neill. “This can happen to any general dental practitioner,” she says in English. “It could last forever without any symptoms, but we cannot be sure.” The pain and swelling O’Neill complains of is what makes Sunisa believe the root canal needs attention. O’Neill’s consultation helps seal her plan to have five dental implants. Including two in the place of bridges she will have removed. She’s had hepatitis B injections in readiness. She hates how food gets stuck underneath a bridge, a false tooth that is attached to teeth on either side but not embedded into the gum. Implants are a more aggressive form of tooth replacement hut leave adjoining teeth untouched. A dental surgeon implants a titanium fixture resembling a screw into the jawbone to act like the root of a tooth. The best result is achieved if a crown is fitted to the implant after three to nine months — which means O’Neill will need to make a return trip. That’s not looking likely for Patricia. She’s having her teeth X-rayed in an adjoining room and was a little taken aback at the concept of implants when Sunisa mentioned them. The idea of “cutting into my gum” makes her squirm. When she returns with her X-ray, Sunisa pops it up on the screen over the examination chair, Patricia’s decision is suddenly casier. Her sinuses are too low; meaning implants would require a bone graft. Bridges it is. However, one of the anchor teeth on the bottom right side is not rooted well enough to support a bridge. Sermsakul is consulted and agrees, leaving Patricia to consider an implant. O’Neill will undergo her own improvements next week after spending much of the first week having bridges removed, her teeth whitened, and X-rays and mouth moulds organised. Her root canal has been redone and one of the clinic’s in-house periodontists has spent two hours cleaning her gums. She has no problems with the clinic’s professionalism. “They are brilliant, they just listen and they’re so quick and efficient and gentle. Couldn’t be better.” She loved the complimentary foot massage she received during the teeth whitening and the fact they stayed open into the night, or worked weekends, to satisfy foreign clients. She counts all implants, crowns and bridges as cosmetic work and argues that a place like Bangkok Smile is more likely to take time with clients than a “busy run-of-the-mill dentist doing a good health job, trying to keep people’s teeth going”. Bangkok Smile says it has a strict system guarding against cross-infection and uses the autoclave system of sterilization, with headpieces also going into the machine — highlighted as important by Coates — at 135 degrees Celsius. 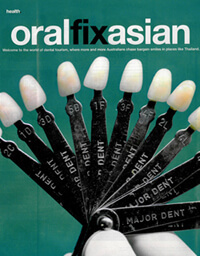 Of course, there are excellent dentists in Asia, says Cones, and some not-so-good practitioners here. “It’s just I would be very selective about who I went to in Asia. Whereas in Australia, 90 percent of the time I could be a lot less selective. AFTER SIX HOURS IN THE DENTIST’S CHAIR, Patricia Penny is in a coffee shop munching on a ham and cheese waffle “with a full mouth of teeth”. It’s a great sensation, she says. Allan’s also feeling better. Patricia’s had two bridges and a set of crowns fitted today in addition to a trickier bridge put on earlier in the week. She’s had her teeth whitened — and the foot massage — and her veneers of 16 years removed. Four new front ones will go on next week. The bill, which includes X-rays, came to AU$100. JOAN O’NEILL HAS WALKED THE BRIDGE OVER THE River Kwai, rejected the advances of foot masseuses in the night markets and bought a ‘r-shin that reads “Care u Teeth”. She and Napth inc-Smith mastered the Bangkok Sky Train giggling every time they heard Nana station announced — and filled a bag full of treasures. They were wary when they left Thailand. “We had so many laughs,” says O’Neill. She smiles, revealing her gleaming, veneered front teeth. The sight inside her mouth is not as pretty. What look like metal rings can be seen sticking out from inside the gum. Metal Mouth, as she is now known to friends, admits to a moment of panic when the dental surgeon began the implants. “I wasn’t seared until that second and I was thinking, ‘please, please don’t stuff this up’. He numbed me, but I could feel the pressure of the cut into the gum and then I felt the explosion of the blood.” Next came a drill, and the sensation of the surgeon ratcheting a screw into the hole. Two weeks after the implants, she’s still on antibiotics and hasn’t tackled a steak. She probably won’t until after she returns in six months for the crowns. An old Bangkok hand now, the prospect of going back is not that scary anymore.